The family of George H. W. Bush in mourning. George H.W. Bush was a man who accomplished much in his life; he was loved by all and was a friend to anyone. After losing his beloved wife Barbara in April 2018, life was becoming hard. Many thought he would die of a broken heart. His wife of 73 years was gone. 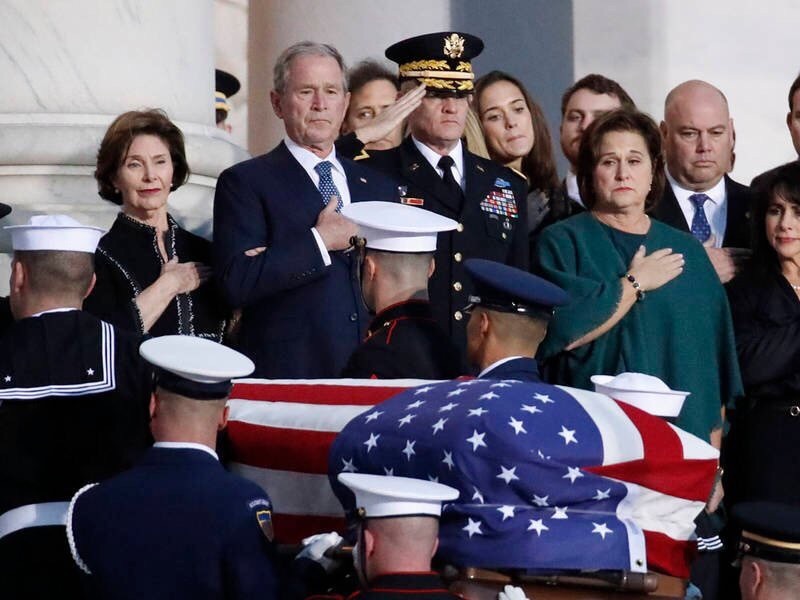 He honored her life in a beautiful funeral and tried to move on with his life, but the day after Mrs. Bush died he was hospitalized for an infection in his bloodstream. He had had many previous health issues in past years, including Parkinson’s, and had used a wheelchair to get around. Eventually it all became too much, and on Friday November 30 he died. President Trump declared it a national day of mourning. Bush was 94 years old. Everyone who knew him called him an incredible man who accomplished much in his life, was a friend to all and was loyal to his country and the people who lived there. Many people came to show their love and respect at his funeral. Ninety-five year old former senator Bob Dole, who had twice competed with Bush for the Republican presidential nomination, made an emotional appearance Tuesday afternoon in the U.S. Capitol Rotunda. An aide helped Dole out of his wheelchair so he could stand briefly before Bush’s body to salute him one last time. George H.W. Bush was beloved and respected by all, even his competitors. He will forever be remembered as a selfless, caring and loyal man, and will be missed by many.